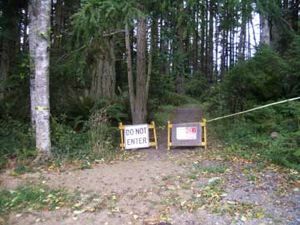 The Vista trail heading east along the coast from Salt Creek Park is closed. According to the signs there was a big landslide that wiped out the trail completely. This has always been a very pretty trail, heading up and down along the bluffs and headlands, and you know what that means. On the positive side, the trail up Striped Peak is still open, and, as you can see in the pictures below, there is still some spectacular coastal scenery to enjoy and explore. 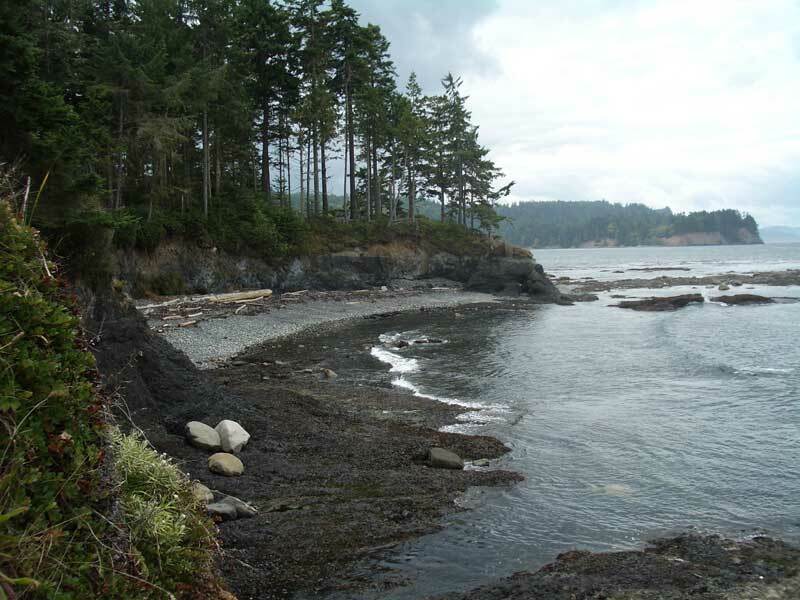 Can you believe that this is a modestly priced, county run campground? The remodeled, now glassed in grange kitchen looks great. 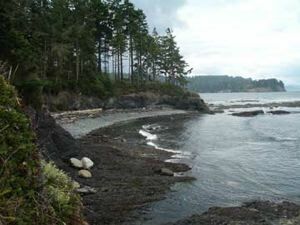 Salt Creek is not a serious rival to Olympic National Park, but it deserves a bit of public praise now and then. 08/27 - Lake Angeles is for Swimming - Who Knew? We had an amazing new experience up at Lake Angeles. We went swimming. 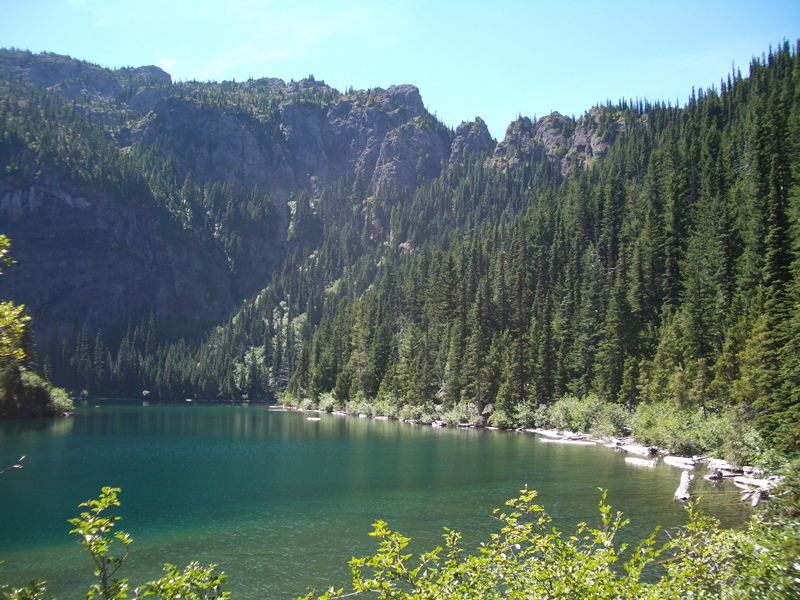 We've been climbing the two thousand feet and then some to Lake Angeles for over five years, and each time we would get to the lake, climb the rock that sort of looks like the one that Psyche sits on in the old Schweppes logo and then turn around and march back down. This time, we noticed something different. There were people out in a canoe on the lake. We had seen tents and other hikers and even campers up at Lake Angeles before, but never anyone on the lake. We decided to wander around a bit longer, and while we wandered south from Psyche Rock, trying to keep close to the lake, one of the canoers, dressed for swimmng, told us something we had never realized. 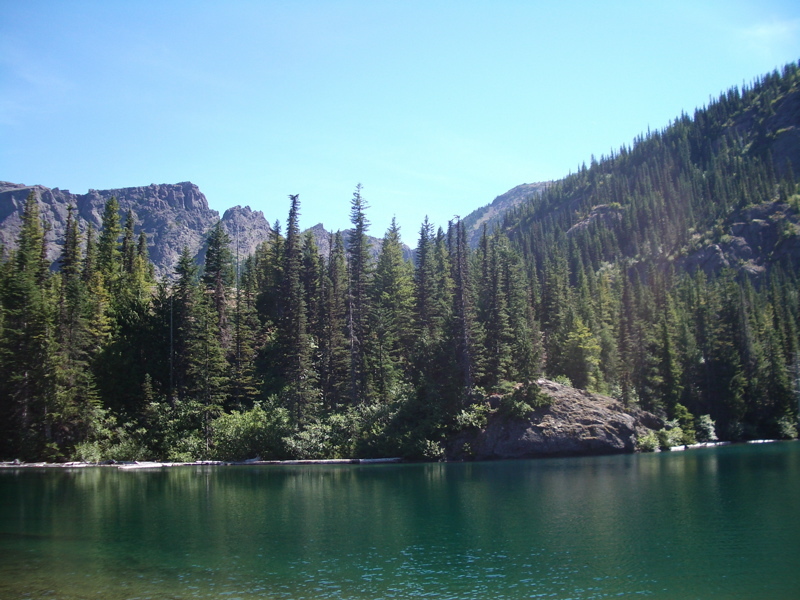 There is an easy way to get into the lake for swimming, or canoeing. A bit past the southernmost campsite, there is a path to the lake where the lake bottom is not all sloggy and muddy, and that this is the best place to get into the water. We had to try it. Indeed, the lake bottom was not sloggy or muddy, though the little stones underfoot made us wish we had packed our dive socks. Still, we were soon sloshing around in the lake, enjoying the fantastic views of the mountain wall that surrounds much of this body of water. In late August, the water was brisk and cold, but no longer frigid. 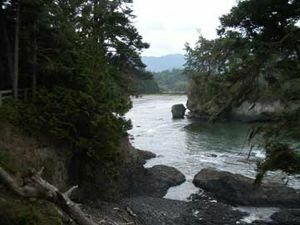 It was totally refreshing, and the aches and pains of our ascent quickly vanished in the cold water. Already, we are planning our return trip, with dive socks and a towel, and hoping the weather holds so we can take another high country swim. We were out at Johnston Farms today and decided to grab a few items that don't even make it as far as the Farmers' Market. 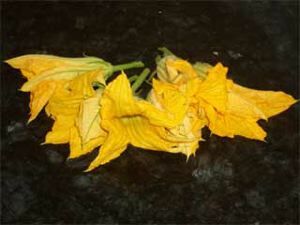 To start with, we grabbed some pumpkin flowers, and we plan to fry them tempura style. We also grabbed their entire basket of Costoluto tomatoes, fresh from the greenhouse. 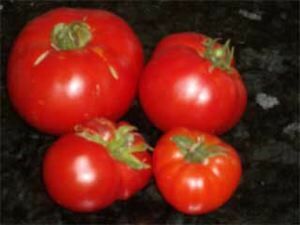 These are a relatively dry, firm tomato, with an incredibly rich, summery flavor. 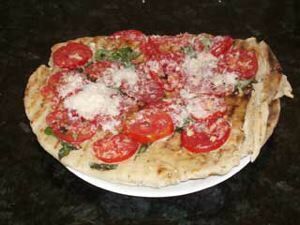 We just had to fire up the grill and make pizza with minced garlic, olive oil, basil, Costoluto tomato slices and grated parmesan cheese. If you have never had a grilled pizza, you don't know the heights to which pizza, nature's perfect food, can ascend. We'd do an entire web page on these pizzas, but the fire is hot, and our hands are full grilling them. We couldn't resist. Check out our grilled pizza guide. We were up on Hurricane Hill and spotted those strange looking plants on the left. 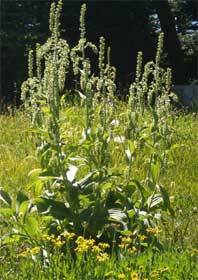 Not the little yellow flowers on the ground, but the tall spiky plants with little white flowers on the spikes. Apparently, they are corn lilies, if our trail companions are to believed. They are blooming on the side trail that leads down to Whiskey Bend from Hurricane Hill. 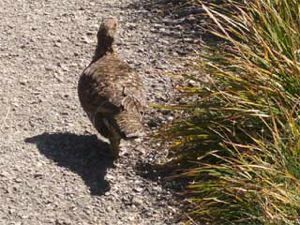 We have been noticing blue grice, or perhaps grouses or grouse, alongside Hurricane Ridge Road, but it isn't safe to stop and gawk at them, so we just drive on. Now, we've spotted one on Hurricane Hill, as seen above, and we were glad to have a closer look. We have been terrible about posting this month. 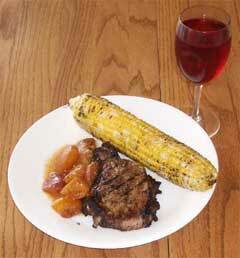 On the other hand, we have been eating well, and the pork chop dinner, shown on the left, was one of the triumphs. We have a page full of notes, recipes, and dime store philosophy, if you care to learn more.